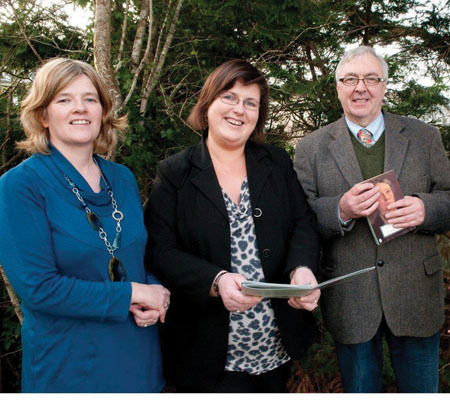 Marie Mannion, heritage officer with the Galway County Council; Bríd Higgins, project manager of Friends of Coole; and Ronnie O'Gorman, chairperson of Friends of Coole at the launch of the Coole Park Winter Programme. The Friends of Coole, in partnership with the National Parks and Wildlife Services, Galway County Council, Galway Rural Development, Galway Education Centre, Fáilte Ireland West, and the community of Gort, has launched its winter cultural programme with a feast of drama, heritage, music, and poetry for all ages. Events at Coole will begin next week and the 2010 Winter Programme brochure is now available from Coole Park and outlets in Gort and surrounding towns. The Coole Park Cultural Programme aims to provide a series of high quality multi-disciplinary arts and heritage events to as wide and inclusive local audience as possible in a site that has national and international cultural status. The biannual programme endeavours to showcase locally based artists and lectures on locally based topics. The programme was initiated in 2005 on a pilot basis and its success to date is largely due to the strong partnership of agencies and active community involvement in its organisation, delivery, and support. The heritage course, Reading and Understanding the Coole Landscape, will begin on Monday and continues until the end of November with lectures every Monday from 8pm to 10pm. This Monday Christy Cunniffe will speak on the built heritage at Coole. Other speakers during the course include Finola O’Kane Crimmins on 18th century designed landscapes, Marie Boran on estates and landscape in east Galway 1800-1900, Mark Greene on reading the landscape of Coole from maps, Bridin Feeney on digital mapping and biodiversity, Caitriona Carlin on biodiversity at Coole, an NPWS representative on the management of the Coole Park Nature Reserve, and Paul Naesen on the landscape archaeology of Coole Park and environs. The arts element of the programme begins with drama on Thursday October 21. Teatro ao Largo will present Mighty Tales, stories — The Acorn Man and The Tale of Francis Flute — told in song and rhyming verse, featuring its original mechanical theatre. This show is suitable for an audience of all ages. On Sunday October 24 Cups and Crowns will present Blenny the Waterdaugther at 4pm. This will be preceded at 2pm by Coole Trees in Winter and outdoor nature activities including scavenger hunts. Thursday October 28 will feature a feast of poetry with Tom Mathews and Ger Reidy. Sorcas Quircas will perform Momo, a puppet-box-play about how valuable it is to have time, on Sunday October 31 at 2pm. This will be followed at 4pm by a concert by Emmet Scanlan and his band. Performances to watch out for in November include Dog and String Theatre, traditional musicians Charlie Harris and friends, Eleanor Feeley performing The Changing Moon, and Sean Tyrrell bringing some of the well known poems to music and song. An outreach programme will also take place with Yourman's Puppets Schools performing at one of the local national schools and a placenames project taking place in Kiltartan National School. All events in Coole Park Winter Programme are free. To obtain a programme or for further details on events contact Coole Park Visitor Centre at (091 ) 631804. Page generated in 0.1860 seconds.